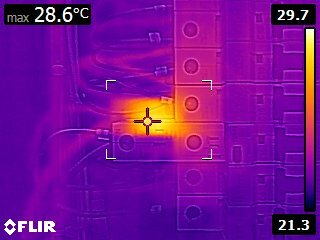 Discover electrical faults quickly and accurately with our Thermographic Imaging service. Potential problems include loose or corroded connections and cable points, load imbalances or overloads. By comparing the temperature rise of the fault with the correctly operating component under the same loading conditions the severity of the problem can be determined.